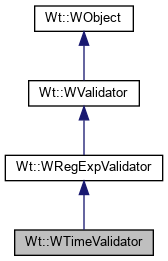 Returns the validator current format. Sets the time formats used to parse time strings. Returns the time formats used to parse time strings. Returns the lower limit of the valid time range. Returns the upper limit of the valid time range. Sets the message to display when the input is not a time. Returns the message displayed when the input is not a time. Sets the message to display when the time is earlier than bottom. Returns the message displayed when time is too early. Sets the message to display when the time is later than top. Returns the message displayed when time is too late. Sets a new regular expression validator. Sets regular expression matching flags. Returns regular expression matching flags. Provides Ext-compatible config options for client-side validation. a message that indicates the problem if not valid. Returns an empty string if the validator does not provide a client-side validation implementationq. The signature and contract changed changed in Wt 3.1.9. Sets the lower limit of the valid time range. Sets the upper limit of the valid time range. The input is considered valid only when it is blank for a non-mandatory field, or represents a time in the given format, and within the valid range.